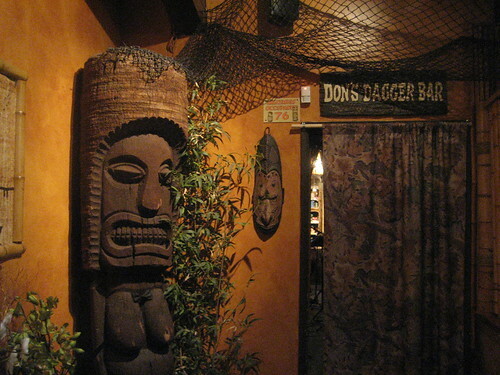 Don the Beachcomber, Huntington Beach – Carrying on the tradition of Don the Beachcomber, this expansive restaurant has a great happy hour and also hosts the International Tiki Marketplace, a monthly gathering with food, drinks, music and tons of tiki stuff for sale. Trader Sam’s, Disneyland Hotel – If the Disneyland crowds get to be too much, escape to this truly enchanted tiki bar where ordering your cocktail might trigger a volcano eruption. Tangaroa Terrace, Disneyland Hotel – We used to fuel up on food at this quick-service restaurant before going to Trader Sam’s, but they’ve since started serving some of the same dishes so you might as well head straight to the bar next door. The Beachcomber Cafe at Crystal Cove – A beautiful and very popular beachfront restaurant with a few signature tiki mugs from Tiki Farm. The Bootlegger Bar at Crystal Cove – When the wait is long at The Beachcomber Café, belly up to this outdoor bar inspired by Crystal Cove’s prohibition history. Old Town Orange – Take a stroll around this charming historic district and you’ll spot beautiful classic cars and maybe a tiki or two. 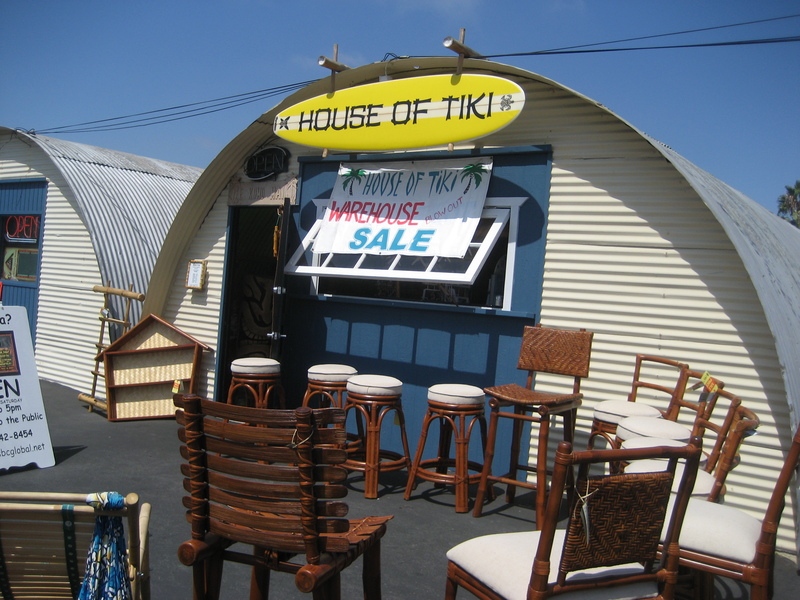 House of Tiki, Costa Mesa – This family-run shop brought a slice of Hawaii into a World War II Quonset hut. Pizza Oom Mow Mow, California Adventure – A surf-inspired pizza place with cartoony tiki columns. Trader Sam’s Tiki Juju from Adventureland Trading Company – Part of a special promotion called Adventureland Trading Company, Trader Sam’s sold JuJuJuice that came with a tiki charm. New “Adventureland” Tiki Merchandise from Disney – The Disney Store recently released a boatload of new Adventureland-themed merchandise that includes glasses, tiki mugs, pillows, plates and more. Enchanted Tiki Room Easter Egg – The Springtime Roundup at Disneyland featured decorated eggs and one of them spotlighted the logo from Enchanted Tiki Room. Recreation of the Original 1963 Brochure for the Enchanted Tiki Room – As part of Disneyland’s Limited Time Magic promotion in 2013, annual passholders who visited the attraction received a free recreation of the original 1963 brochure for the Enchanted Tiki Room. Enchanted Tiki Room 50th Anniversary Merchandise Event – The Disneyland Hotel hosted this special event with tons of merchandise and fascinating Q&As with imagineers Bob Gurr and Rolly Crump. D23 Presents Treasures of the Walt Disney Archives – This exhibit offers the rare opportunity to see an interesting piece of tiki-related history — the mechanical singing bird that inspired Walt to develop Audio-Animatronics. 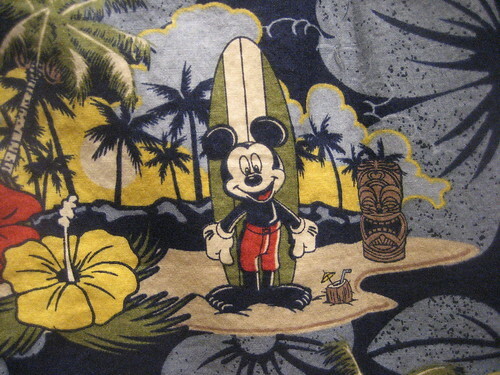 Mickey & Tikis Aloha Shirt – Disney has produced quite a few aloha shirts over the years — this particular one was printed with tikis, coconut drinks, palm trees, hibiscus flowers and surfin’ Mickeys. WonderGround Gallery, Disneyland – A new art and retail concept at Downtown Disney, WonderGround Gallery seems to give their artists a fair amount of freedom in representing the classic characters. Enchanted Tiki Room Pumpkins – I love seeing the creative carved pumpkins at Disneyland’s HalloweenTime, especially these made to look like the tikis from the Enchanted Tiki Room. The Colors of Mary Blair – In 2011, the Disney Gallery hosted an exhibition of Mary Blair’s art, including her New Guinea ideas for It’s A Small World. Artist Sketch Program – At the Disney Gallery, you can buy artist sketches of “Park Icons” like Jose from The Enchanted Tiki Room. Rolly Crump Article – Los Angeles magazine published an article about Rolly Crump, one of the imagineers behind The Enchanted Tiki Room. 55th Anniversary Adventureland Art – For Disneyland’s 55th anniversary, Kevin Kidney designed a collage for each of the lands, which were in turn featured on glasses. Shag’s Disney Cruise Line Merch – Art, t-shirts, glasses and postcards designed by Shag for the Disney Cruise Line. Shag’s Haunted Mansion Merch – In honor of the Haunted Mansion’s 40th anniversary, Shag gave those spooks his signature style. Tiki in Toy Story – Have you spotted the Moai in “Toy Story 3”? Enchanted Tiki Popcorn Bucket – Blink and you might have missed seeing Pele on a popcorn bucket.